Rich Crankshaw is New York City Voice Talent and currently represented by AB2 Talent. He graduated from The New School of Contemporary Radio and TV in 1991. He is trained as a broadcast journalist and has worked on air and in radio production. Since 2003, he has freelanced and produced his own voiceovers in his professional home studio. Most recent clients include Bayer Life Science center, Sebastian Professional hair care products, various online gaming characters, and voiceovers for a variety of E-learning and education videos. Currently he is the main announcer for Audible.com. Before you consider equipment, you have to consider your goals, where you live, and your budget. Where do you want Voice Overs to take you? Am I in a market where I need a studio in order to work? How much should I spend to get started? Because of the emerging technological landscape, you can literally be anywhere in the world with an internet connection. You have to determine what is best for you, given your circumstances. If you live in NYC or LA, money may be better spent on quality coaching, a professional reel, networking, and mailing/emailing blasts to hunt for an agent. But even so, most cases that follow this route, still may not see blockbuster results right away. It is still wise, in my opinion, to set yourself up with some kind of recording ability in your home. If you live in a smaller market, as I did when I first decided to jump into this game, then you absolutely must invest in equipment that will allow you to not only function, but also, compete. Online casting is a real way to not just freelance for work, but it is priceless in regards to the real world practice you can take advantage of. Every day hundreds of scripts are available with directions from producers, directors and voice seekers all over the world. With a decent quality home studio, you can systematically develop yourself into this business. Without a home studio, you are at the mercy of others to get the job done. And you will be hard pressed to find anyone in today’s market with a story of success that began with them knocking on people’s door asking them to use their studio, or having the money and time to pay a professional studio every time you want to audition. Put your fate into your own hands, don’t rely on anyone. I think it is clear, you need a studio. Now what are your options? Laptop, usb mic, free recording software and blankets on the wall? Or do you jump right into a more costly set up, with an interface, expensive software, a quality condenser mic, and really fast computer? Once you determine one or the other, then you can research the equipment needed to begin. Right now, you and I can access more information in one day than people could in an entire life time hundreds and thousands of years ago. I am a proponent of self-reliance and finding out anything I need to know through a key word search. I could easily give you tips on specific equipment, but it will do no good. Once you know what to look for, you will learn a great deal just by searching out what’s best for you on your own. Two of my most valuable tools are Youtube and Google. Every piece of equipment known to modern man has at the very least, an overview of the product or service posted on youtube. In most cases, you can find full tutorials. Google can help you find posts from others who are experts in a given field. You can read dissertations, bios, full articles etc. So I will focus this particular article on logic, not specific equipment. Now is the time to begin to use the power we all have access to every day, and harness it for your benefit. Let’s begin with what probably is the most practical first step, no matter where you are, and what your circumstances are; a usb mic, free software, either a laptop or average PC/mac. Go to youtube or google and simply type in your question, or topic, ie; “Best usb mic for voice overs”. Make sure you pay attention to the difference between USB, and Condenser. Condenser mics are more professional, andcostly, and you need an interface with phantom power in order to power it. USB mic is “plug & Play”. You will see that there are plenty of pretty good quality USB mics under 200.00. Now search out, “free recording software”. Audacity remains one of the more popular free recording software because it is pretty easy to use. For most people, just like that, less than 200.00, you are ready to function. If you’re reading this, you at least have a computer, or laptop. Just by upgrading to a better quality USB mic, you can begin this crazy journey. Obviously, this is the bare minimum, but it will serve you well to start recording auditions, make your first demo, and learn. From the research you have done on your own, just to get to this point, you have learned a lot. Now, time to get moving. You should see the value in constantly upgrading. By now you are able to begin the never ending process of trouble shooting your sound. If all you have done so far is buy a 200.00 USB mic, then you are experiencing some echo, a tinny sound, or feedback. This is because the sound waves from your voice are bouncing all over the room, hitting the walls, and going back into your mic. This is undesirable to your future, period. Even when auditioning, so many decisions are made based on the basic quality of your sound. You must address the treatment of your room. Google, or youtube search the following; “sound proof my room on a budget” or “sound proof my studio for Voice Over”, etc. You will find tons of tips and ideas that will fit your situation. In NYC and LA, you can keep this set up, and still have opportunities. When you are in either one of those markets, the voice seeker can easily overlook slight sound quality issues, knowing they will have you in a professional studio for the job. But that is not the case in smaller markets. You need to constantly strive towards a professional sound. Your goal is to upgrade to a professional recording interface that allows pro audio to input into your computer, professional condenser mic, a fast laptop or PC/Mac, either a vocal booth, or a fully treated room. The more you spend, and the more you understand, the better chance you have to earn money from your home studio. My studio is as good as any post production commercial studio. I live in the NYC market, and I have the highest possible sound you can have, at home or in a professional studio. But I still have upgrades to consider in terms of how I connect to other studios. I loose opportunities because I do not have ISDN, or source connect. I use ipDTL, but that service is new, and not a lot of studios are connecting with talent through ipDTL yet. I am able to connect to the director/producer through a simple phone patch, or skype so that they can direct me during the session. Then I do basic editing and send the file. Source Connect is a protools plug in, it is costly, but it is worldwide and very common. Even though ISDN is slowing being phased out, many major studios still use it, and some Agents require their talent to have this service. ISDN goes through the phone line, you have a monthly bill, and you need expensive equipment and an engineering degree to figure it all out (joke). My focus is on a true phone patch, which is similar to what radio stations use, and source connect, because I use Protools. For me, that would be the most practical investment. I will not even consider ISDN right now, simply because it is not the future. But if business required it, and if I could fund it based on income that requires ISDN, I would indeed incorporate ISDN into my studio. I make a significant income from both my home studio, and from professional studio sessions throughout NYC. I personally do not want to sacrifice either one. In fact, my intentions are to never stop upgrading myself, and my equipment. Upgrade yourself, you get more work in the big studios. Upgrade your equipment, you get more work at home. Who doesn’t want more work? This business is extremely difficult. It is not the kind of business where you can simply know someone and start getting paid. If you cannot take rejection, and failure, you will not last. If you don’t follow trends, and act upon them, you will be phased out quickly. This business reflects technology. It is state of the art. You need to be state of the art. And be prepared to recognize what that is, and be aware that it changes like the seasons. My experience in this business has been unbelievable. 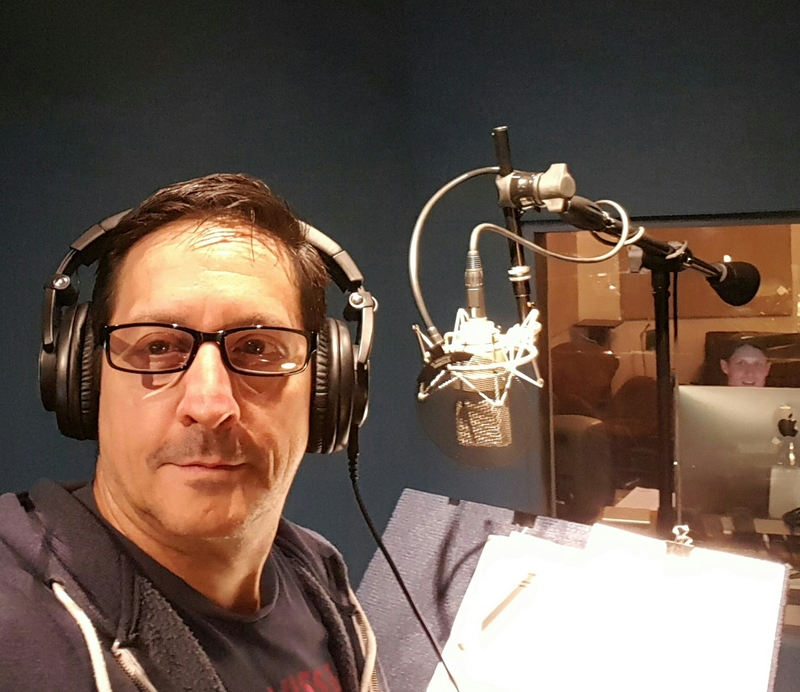 I am still humbled, and amazed that I can say, “I have established myself at a high level as a voice actor”. The sacrifices and time and money I have spent to get to this point have been great. But “nothing” comes from “nothing”. Pretty simple statement, really. Honestly, without my investments into my home studio, I am not sure I would have stayed in the game long enough to see the rewards I am seeing currently. And this is the tip of the iceberg. I am not at the top yet. The top Voice Actors in the business make 6 and 7 figures just from residuals, they don’t even care about the session fees anymore. The pinnacle of my goals, animation, are of course, the voice Actors on The Simpsons, each making over seven hundred thousand dollars an episode. But….. You can’t have that prize without hard work, and sacrifice. You need to focus on what it takes to reach that goal, not the money you will get once you are there. In today’s Voice Over market, your home studio is every bit as important as your actual voice. Best of luck, this is the greatest business in the world, but it is also one of the most competitive, you have to earn the right to be in it. I’m traveling to NYC in July and Chicago in Sept. and looking for recommendations for coaching while I’m there. Any suggestions? I will ask our talent who live there. They will be the most knowledgeable. Rich…..what do you think? He worked with me one on one for a few sessions and then we produced my commercial reel. Afterwards, he held networking sessions once a month where a few of us that had gone through is program would have the opportunity to read for agents casting directors etc. It really was well worth the investment. He does kind of like to pick and choose however. He will not be cattle call service open to anyone, he is interested in those with have a future, that he can reflect back upon as representing his service. Reach out to him and see what he says.